A light and moist chocolate cake with the easiest fudgey icing you’ve ever seen. Our classic chocolate cake recipe is easy to follow, and whether you whip it up for a celebration or a family treat, it’s sure to be a hit! 2. Sieve the flour, cocoa and bicarbonate of soda into a bowl and stir in the sugar. In a separate bowl, whisk the oil, milk, eggs, half the vanilla and a tablespoonful of caramel until smooth. Then mix into the flour mixture (it will be quite runny – that’s fine!). 3. Pour the cake mix into the tins and bake for about 20-25 minutes until springy. Cool the cakes in their tins and then turn out onto a cake rack. 4. Melt the chocolate then beat in the rest of the caramel and vanilla, beat well until smooth and glossy. 5. Put one half of the cake onto a plate and spread with a few dollops of icing on top. Sandwich with the other half. Spread over the rest of the icing – on top or top and sides – it’s up to you! Recipe contains gluten, milk, eggs and soya. Hi, is it possible to make this cake gluten free and with rice flour? If so, what changes would be made to recipe and what quantities of ingredients would I use? Hi Louise, as this recipe is oil based, it works well with gluten free flour. You'll need to add a little more flour than listed in the recipe; just enough to ensure that the mix reaches normal consistency. We haven't tried this one with rice flour ourselves, but let us know how it goes! Hello, we have not tested this recipe with rice flour. Please update us if you have any success with a gluten free adaptation. Hi, what changes should I make if I use plain flour instead of self raising flour. Hi Divya, if you're using plain flour, we recommend that you add 2 tsp baking powder for every 150g/6oz of plain flour you use. Sieve ingredients together so that the baking powder is evenly spread. Hello Nessa, this Chocolate Fudge Cake is perfect for all celebrations! experts be able to advise the ingredients for a 22cm cake please. I should imagine this cake will be one of my family favourites for a long time. Many thanks! Hi Julia, Great to hear that your cake went down so well with your family. Always nice to hear of a baking success! I cant find any carnation caramel in our area. Is it ok if I use the carnation condensed milk instead? Hello Jrahm, this is a delicious fudge cake and the Carnation Caramel adds richness to the flavour and ensures a soft texture. If you have Carnation Condensed Milk available the Carnation website is full of delicious treats. I'm making a large cake for my husband's b'day. I have a 30cm tin so was going to cook it in one tin and then cut the cake in half and ice. What quantities do you think I'd need? Hello Heather, in order to get a good rise on the cake it is best not to over-fill the tin. For a 30cm tin you will need double the recipe. For best results, bake this in two tins and remember to adjust the cooking time to ensure the cakes are baked through. Hello Molly, this cake is a delicious treat! Make sure your sieve the dry ingredients and give the eggs a good whisk for a lighter texture. I made this and the sponge didn't turn out as chocolatey as I hoped, do I just add more cocoa powder? Hello Nicola, if you are after a more chocolatey finish then add up to one extra table spoon of cocoa powder. It is important not to add too much dry ingredients to the mixture so that your cake is nice and moist. Hi Nicola, no need for butter as this recipe uses vegetable oil instead. Hi, how long does this came stay fresh for please? Hello Danielle, as with most cakes this Carnation Chocolate Fudge Cake will stay fresh for about 2 days if it is stored somewhere cool in an air tight container. You could keep it in the fridge for up to 5 days but remember to take it out ahead of time so that it can come back to room temperature before your enjoy it! I made this cake today and its turned out quite flat I used 9" cake pans is the cake meant to be flat? hello Carol, sorry to hear you have a flat cake. Always ensure you sieve your ingredients, this will airate the mixture and result in a lighter, springy cake. This is simply the best fudge cake recipe ever. It's simple to make and turns out beautifully every time. My daughters favourite birthday cake. I have made this twice, both times increasing the amounts by half so using 3 eggs etc..I split the mixture between 2x 8" (20cm) cake tins. Also I increased the sugar to nearly the same amount as flour as first time I found it to lack sweetness. It is now my go to recipe for chocolate cake and everyone who has tried it has loved it!! Thanks carnation! OH WOW this was amzing! i made it for a get together and it was a hit, so moist and delicious and not at all bitter. I made one and a half of the mixture and split between two 8'' tins, PERFECT! i've just made cupcakes with this recipe and they're perfec. 20 mins in oven top shelf, made roughly 12. THANKYOU CARNATION! Made this twice. Perfect every time and such an easy recipe. Not going to lie, im terrible at making cakes but this turned out perfect! I made this cake for a birthday and used milk chocolate. It was fantastic! Everyone loved it and my hubby made me make it for his birthday too. Everyone at his work didn't believe I made it. They thought it was from a patisserie. The sponge is so moist and light. I Used 2 very heaped tbsp of the caramel in the cake. Hi, does anyone know if you can make this cake in advance and freeze it? Hi Pam this cake freezers very well. For best results freezer the cake before decorating, defrost and then ice and decorate. Hi Chris, there is never enough of this delicious cake to go around! If you are catering for larger numbers try increasing the ingredients by half to fill a 10 inch tin. Be aware this will take longer to bake. Check the cake after 35 minutes it should be springy to the touch. What is corn oil? Can I just use vegetable oil? Hi Donnamarie, Corn oil is a form of vegetable oil that is low in saturated fats and comes from corn. Vegetable oil will work just as well in this recipe. Hi, I want to make this cake for a kid's birthday and was wondering if I could use milk chocolate for the frosting as he's not a fan of dark chocolate? Hi Maria, the dark chocolate in this recipe will not give you the bitter flavour you would have if you ate it plain because it is added to so many ingredients. That said if you feel it is safer then milk chocolate will work. Can this be made as cupcakes and what would be the best way to make the icing thicker so it could be piped onto cupcakes? Hi Pauline, this recipe can be turned into cupcakes. Remember to reduce your cooking time. If you want to pipe the icing you could chill it in the fridge for 2 hours or why not try the frosting from the Smartie Cupcake recipe. Another question. On the video it looks like he is added more than tablespoon of icing sugar to the frosting; which is correct. Also, if the fronting is left to cool, can it be used to pipe on cupcakes? Hi Pauline, the recipe is correct as it appears on the website. If you chill the frosting in the fridge then it will become firm enough to pipe. Has anyone tried making this as cupcakes? Hi Pauline, split this recipe between cupcake cases and bake for about 15 minutes and this recipe will make lovely cupcakes. The texture is a bit more dense than typical cupcakes but very delicious. This cake is just fantastic! It moist, tastes amazing & so straight forward to make. Its a huge favourite with family & friends. Excellent recipe! Only change I made was using baking powder instead of bicarb (personal preference) I've made it at least 8 times so far, turned out perfect each time. Recipe also makes great cupcakes! How long would I bake it if I doubled the recipe in a 10 in round tin please. Hi Kay, every oven is going to have a slightly different cooking time. The current recipe times are 20-25 minutes. Leave you double volume cake for 35 minutes before checking it is cooked. Bake at the same temperature. Hi Yasmin, normal vegetable oil will work just as well. I was useless at making cakes, always came out flat, but I made this cake a few weeks ago for my oldest sons birthday and it was FAB! So easy to make & delicious to eat - kids loves it! It's my youngest sons birthday tomorrow and guess what I'm in the middle of making???? Can I make it and freeze portions of it? Hi bryony, if you'd like to freeze this recipe we recommend freezing it undecorated. Defrost and decorate closer to the time. Hi can you help me to the new measurement as I'm using 8" cake tin for this. Really love to do this for my son first birthday ( with all mummy's work and effort :) ) many thanks. And also the baking time what will be? Hi Mai, the recipe is written for a 7 " tin but will work just as well if you use an 8". It will be a little tinner but just as good!Your cooking time won't change too much so check the cake at the 20 minute mark and then leave a little longer depending on your oven. This cake is amazing and super moist, thank you for sharing the recipe. I have a charity event where I was asked to bake this cake but I'm traveling 4 days before the event and was wondering if I can freeze the cake after cooling and icing? Hi Lina, the chocolate fudge cake freezes beautifully but it is better to ice it once it has been defrosted.. Make sure you cool it completely then wrap it up tightly and freeze. You can make up the topping and ice it just once you get there. Its much easier to transport undecorated. I want to make this cake using 9" tins. Do you suggest I use same quantities of ingredients or use 1 and half times? Hi Carolyn, if you make this recipe in the 9" tin it will be thinner. 1 and half times the recipe should work well but be aware the cooking times will change! I have made this many time now and it is a massive hit with anyone who tries it. I like to warm it slightly and serve with vanilla ice cream. A winning recipe!!! I made this for my husband and everyone who tried it has since asked for one. It's awesome tasting and v easy to make. I'm going to try it as cupcakes today....yum! I am coeliac and I made this with gluten free flour.It was the yummiest!! Gluten free flour leaves an aftertaste (at least I think so)..but the cake is so richly chocolaty that it isnt a problem..also none of my family realised that it was G/F until they saw me eating it!! YUM!! Hi Pat! Fantastic - so glad it works well with gluten free flour - as it is an oil based recipe it stays nice and moist and we think this is why it works well with the gluten free flour. Happy Days! Made this at the weekend for the first time... It won't be the last!!! Absolutely deeeeeelish!!!! One point I would like to make is that I personally think there needs to be more mixture if using 2x7" tins - personally, I'd be more inclined to either use smaller tins, or double the mixture. I'm used to my cakes being a lot deeper than these turned out. We think this recipe should work ok for cupcakes but we haven't tested it so couldn't say how many it would make.. Bake for about 20 mins at the same oven temp. Best of luck! Or you could try our Smartie cupcakes instead? 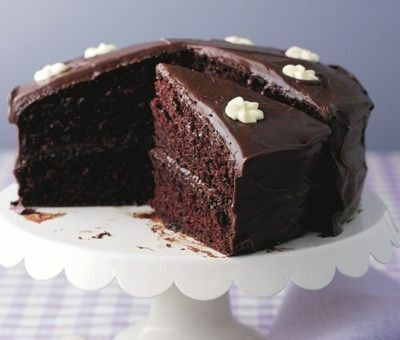 This is by far the best chocolate cake I have ever baked, However my icing is always quite runny, I cant see this being normal as the picture suggests it is quite thick and could be spread easily whereas mine just runs, what am I doing wrong? It still tastes beautiful but I would like it to be a bit thicker so looks neater. please somebody help? Thanks! Hi Chloe, if you leave it to cool slightly before you spread it that should work. Or otherwise you can add another 25g icing sugar. Wow!! Having attempted several chocolate cake recipes - I had given up on finding a good recipe until I came across this one. It is both easy and fab! Thank u Carnation! Hi Aine, you're very welcome! HI.can i substitute corn oil for another oil? I live in australia and i don't think we have corn oil. Hi Emily, yes you can use an unflavoured oil such as sunflower or ground nut oil? Happy baking! Fantastic cake - I will never need another choc cake recipe ! I used it for my daughters birthday cake which I iced traditionally, so what to do with the leftover fudge topping but ice and decorate biscuits with it - yum !! Top tip Jenny! So glad you like the recipe - its in our top 10 most popular on the website! Hi Sam, we always use dark eating chocolate for everything in our recipes - it just tastes better! This cake is very good and moist cake . Liked by all the family and friends. Can I get a copy of this recipe in US ingredients? Made this cake it was fab. Light, moist sponge and the choc fudge icing was really good. Will defo make again. Well worth a make. I have forgotten to buy corn oil, can I use anything in its place. Please help! Hi Adam, corn oil can be replaced for an unflavoured oil such as groundnut or even vegetable oil - but make sure its not old or been open for too long or you will taste it in the cake! Wow, did you know this cake is even moister on the second day?! I need to make a really big one now - 2 x 8" square tin. Would I double or triple the recipe FOR EACH TIN & how long would it take to cook? Hi Clare, sounds like you're becoming a real professional! We haven't tested this in a larger tin - but as a guess we suggest to double the recipe and bake for about 35 minutes, test then continue to bake until its springy to the touch! Let us know how you get on! I couldn't find Carnation caramel at the supermarket. However, I did buy a can of condensed milk instead. Can I use the recipe for caramel from the Classic Banoffee Pie recipe page, and use that to make this chocolate fudge cake? Thank you! Hi Adeline, unfortunately we're not sure this will work, also you will end up with too much caramel this way. Instead we suggest you use the condensed milk as a straight replacement - it will be slightly less caramelly/fudgy but still gorgeous! Once you've melted the icing ingredients together and added the icing sugar - leave it to cool until its thicker and this should be easier to spread over the cooled cake. Happy Baking! Cake turned out great, how far in advance can i make the fudge? Hi Linda, as always best to make as fresh as possible - but the iced cake will keep quite happily for 2-3 days in an airtight container. Or you can freeze the sponges and then ice it when you need it. Happy Baking! Love this but me and my boyfriend aren't fans of dark chocolate, I tried it as normal the first time round but find icing too bitter. The second time I made it I used galaxy chocolate with the caramel, it tasted soooo good! With 2 adults and 1 toddler in the house the entire cake was devoured in 24 hours, just about to bake another. Hi Cat! Sounds divine! You're very welcome - nothing like seeing someone cook to add a little inspiration - sounds like you've mastered it! I have lots of birthdays this month can I freeze this cake? Hi Simone, yes you can freeze it (always best fresh but it does save time to have one ready to go!). Wrap it well and defost slowly - keeps for about 2 months in the freezer. This looks delicious and I'm going to try make it tomorrow - what size eggs are needed please? Hi Sonya, this recipe is very forgiving so you can use medium or large eggs. This cake fast becoming a real favourite on the website - good choice! Happy baking! I made 4 different chocolate fudge cakes with different ingredients and let the family do the taste test - this recipe won hands down - or I should say up as everybody wanted more. Could this be made in a 7 inch square tin instead of 7" sandwich tin? Hi Jinni, yes absolutely fine - it will just be even deeper! Yum! Make sure it springs back when you touch the sponge to make sure its baked. I was bored one day at home and had all of these ingredients in my kitchen, so I made this cake and it was a huge success!! This is the best of the best chocolate cakes!!! I've made it 4 times in a week and everyone simply loved it!! The cake is so moist and the icing... well there are no words to describe it!! I just love this recipe!! This is really easy to make. I didn't have any corn oil so I used vegetable oil instead but it still tasted delicious! Very easy to make and looks really impressive when it has been iced. I have made this cake countess times. It is the nicest chocolate fudge cake ever. I have made so many different variations of this cake and I am making a three tier version of this for someones 18th. People are so impressed. What is corn oil and can this be substituted with other oils? Hi Samantha, corn oil is made from corn or maize and yes you can use other oils - using something like groundnut or even vegetable oil works fine. Happy baking! Hi Kathy - wow that sounds amazing! Yum! This is a fab cake, quick and easy and my family and friends love it. Really easy to dress it upfor a special occasion too. does anyone know if it can be frozen either completed or just the sponge? Hi Kim, we have never frozen the whole cake but we know that the sponge freezes fine so suggest this is the best way and make up the frosting when ready to serve. I love this recipe I've made 4 times. Hi Olivia - we love it too! This is the best fudge cake I have made, so easy but so impressive, would reccomend to anyone. This is the first cake I have EVER made - needless to say I needed to buy all the utensils and ingredients!!! It was a complete success and I was so proud of myself!! So easy to do and much tastier than shop bought cakes! Thanks Carnation! Just made this cake today for my step daughters birthday it is so easy to make I have been making this receipe for at least two years and it it never fails. I won a cake competition at work with this receipe and turned it into a halloween cake. Give it a go it is worth the effort. I've made this twice before and about to make it a third time! Absolutely delicious! So easy to make and it's the best chocolate fudge cake recipe I've come across! I tend to decorate the top with sugarpaste hearts or coloured sugar discs, especilaay if I've made it for a friends birthday! The best chocolate fudge cake! I made this as a present for a friend and all i can do is think about it, can`t wait to bake this again but for me! :) I added extra milk as i live at high altitude and it was perfectly moist and fudgey. I've made this twice before in one tin and both turned out well...Once it it cut in half, I turned the top over to give the cake the flat top it should have...I'm just about to make another one in two tins for the first time! can i make this in one baking tin pls? Chocolate Fudge Cake Recipe is rated 4.9 out of 5 by 22. Rated 5 out of 5 by Wisper89 from Best chocolate cake This is the best chocolate cake ever. I made it once for colleagues and now they don't want any other chocolate cake except this one. Rated 3 out of 5 by SammyB from Lovely flavour - not so good texture! This was a little disappointing - despite the 5* reviews. The texture of the cake was quite airy not dense and squidgy like I would expect a chocolate fudge cake to be, it was also a little on the dry side and did not rise dramatically. The fudge topping was an excellent flavour but a bit runny despite leaving overnight and then putting in the fridge, as soon as I started spreading it, it quickly became runny again and just about stayed put on the cake. Overall everyone loved the topping (which would also make a great sauce) but I would seek out a different cake recipe next time. Rated 5 out of 5 by Archie Hobson from Gluten free success Made this with Doves Farm gluten-free self raising flour, no adjustment to the recipe, it came out perfectly. Only problem is I'm being pestered to make it all the time now!!! Rated 5 out of 5 by Jaxx from Fabulous treat Made this today. I'm not a confident baker but this was easy to make and turned out brilliant. Will be making this again. Rated 5 out of 5 by Cakesamust from Excellent chocolate fudge cake recipe. Made this now three times as it rises beautifully. The fudge icing is particularly delicious and even if I chose to try a different recipe, I would still use the fudge icing to fill it and decorate. Why has this recipe not been adjusted to cater for 8 inch cake tins though? Recommend also that if bakers want to add additional flavours to the filling, try adding fresh raspberries or cherries because next time I bake it, I'm definitely going to add another dimension especially for a birthday cake. Rated 5 out of 5 by mad chicken lady from Super easy fab chocolate cake! My daughter decided that she would like a chocolate fudge cake for her 10th birthday and I found this simple looking recipe. Wow, how great is this? I made a four layer cake and extra fudge icing and decorated with Lindor chocs on top and galaxy counters and it was FANTASTIC! Everybody loved it. very happy mummy! Rated 5 out of 5 by Paul from fab recipe This has become my altimeter favourite cake to make, I have cooked it about 30 times since I found the recipe and I am still making it for family parties and also for my workmates when I find out when their birthdays are.